Hello Friends, It has been doing nothing but rain here in sunny Florida for the last few days and I took advantage of the time indoors to play along with the Sensational Stripes Verve Challenge over at The Verve Blog. Before I got started, I had my thoughts on my son who was on a 65 ft sailboat in the gulf of Mexico (yes during the deluge of rain) over the weekend, so I embraced my thoughts and decided to get out the sailboat from the Verve Stamp set With Love and create a water scene, as I worried. The colors were inspired by the graphic you will see to the left. 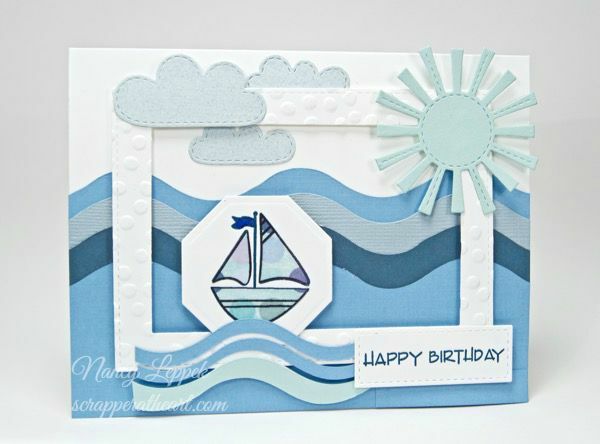 I paper pieced the sailboat and used my Creative Memories wavy cutter to make the water I mean Stripes! The clouds and sun is from Lawn Fawn and the birthday sentiment is also Verve from the Poppy Birthday set. Categories: Uncategorized | Tags: Card making, Cards, Happy Birthday, rubber stamps, sketch challenge, Verve Stamps | Permalink. This is super cute! Love the design. The frame with the water in the background, that cute little sailboat and the stitched sun and clouds…..everything is perfect. Great job! Great card design and love the layout of this card. Perfect masculine design. What an amazing and fabulous layout. How fantastic this card turned out. Us Mum’s are worry warts. I bet Ty had a ball. Love your adorable card and nice color combo. Oh, this is just adorable, Nancy! Love all your waves! This is fabulous, Nancy!! Love the waves and how you framed the scene. Great take on the challenge! Glad Ty made it home safe and sound. I was over the moon when Janina got back after two weeks in Europe and sleep 12 hours her first night back as I was able to fully relax LOL! I can so understand !! Hope she enjoyed herself!! Get some rest!! Hugs!! Another very summery card – love the colour scheme.